Our theme this week is bunnies and we are hoping all over the place as we celebrate these cute and little fluffy creatures. 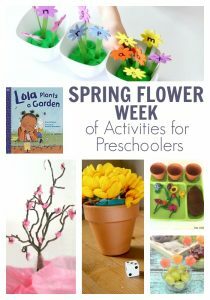 You could use this as a lead up to Easter Activities with your preschooler or as a fun spring theme to do together. 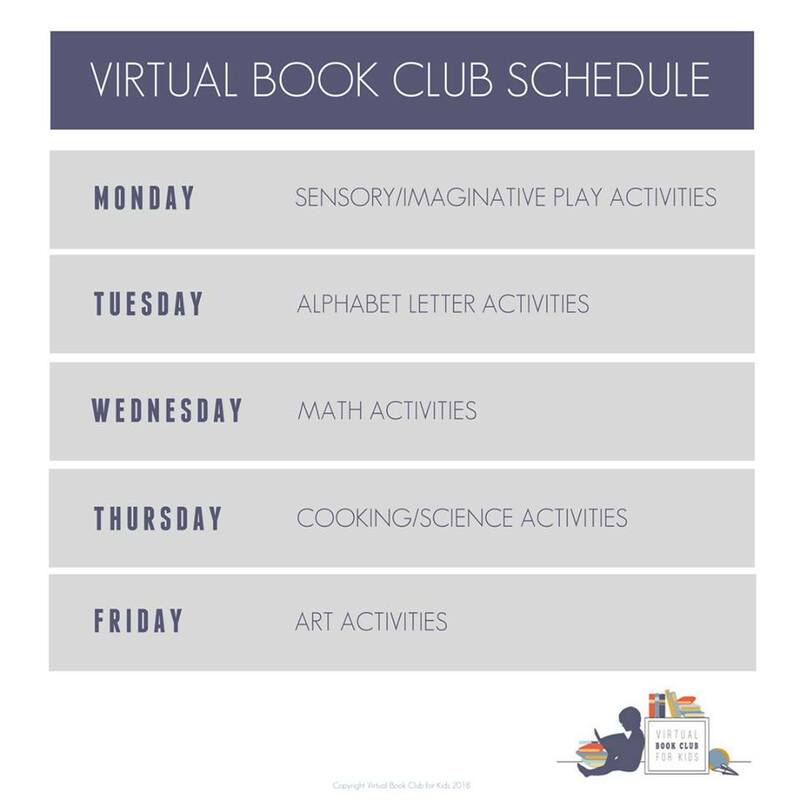 The featured book we have chosen is Knuffle Bunny by one of our favourite children’s authors here on the Virtual Book Club for Kids Mo Willems. 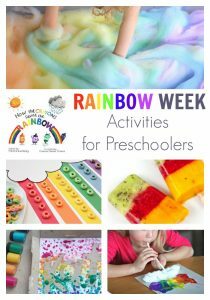 So check out the bunny activities, if you are looking for more books to add to your book basket this week we have some further down and don’t forget to check out our Pinterest board linked below that you can find even more activities for a bunny week we’ve handpicked for you and your preschoolers. 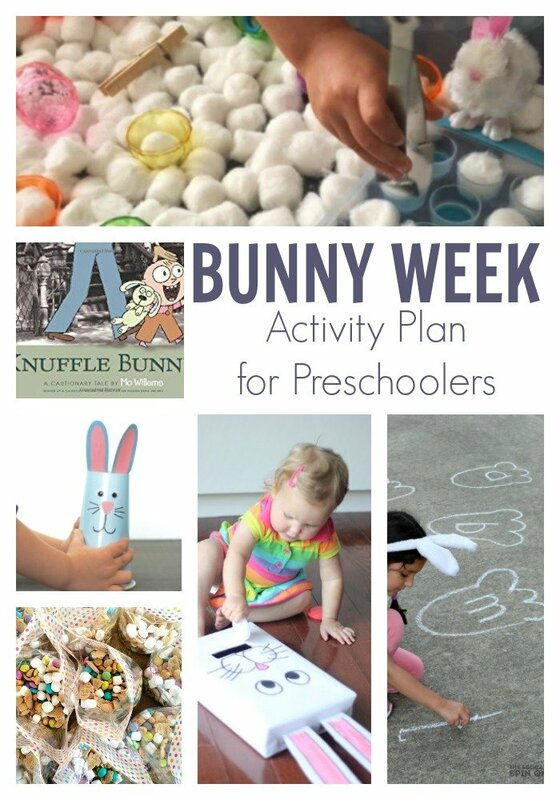 So here we go our Bunny Week Plan for Preschoolers featuring Knuffle Bunny by Mo Willems. This week’s featured book is Knuffle Bunny by Mo Willems. This is a simple and easy to read book that your preschoolers will love. If they have ever lost their favourite toy they will also relate to Trixie in the story. As you read together you can look at the places that Trixie and her bunny go – talk about feelings and much more. 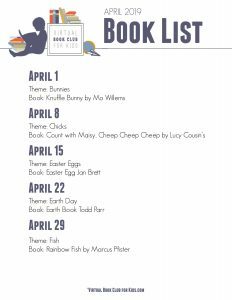 If you are looking for other Bunny theme books for this week check out our selection below. It is up to you whether you choose 1 activity from the week, or do all 5 and how you set up the activities. 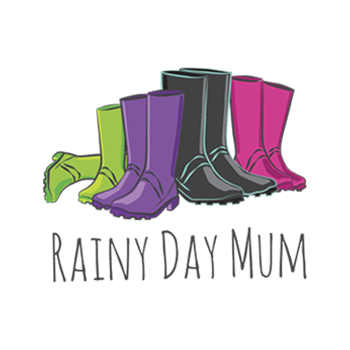 One of the team members here at the Virtual Book Club for Kids has put together a suggested outline of how you could organise your week carrying out an activity a day. You can see how this would work in the image below but it is up to you this is just an idea. We have a simple (relatively mess-free) bunny themed sensory bin for this week’s sensory play activity for your preschoolers. The activity uses cotton balls but you could use pompoms. This bunny hop alphabet activity for your preschoolers is fun to do outside if the weather is good. If not you could cut out some bunny footprint shapes from paper or card and then do similar inside your house. Our math activity this week is focusing on colors and sorting colors. It’s a simple DIY to make your own Bunny and then you can feed it the different colors. Don’t just use it for this -> with the alphabet printables with the bunny alphabet game above you could feed them letters of the alphabet or even the letters of their names. Find full instructions on this Feed the Bunny Color Sorting Game for Preschoolers here! 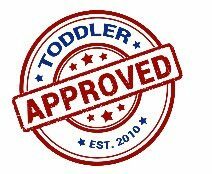 Our cooking activity is more of a snack idea and is ideal for preschoolers and you to make together. It’s to create a Bunny Trail Mix this is perfect for your preschooler to snack on and it’s easy to make. The little marshmallows look just like bunny tails. Here’s the ingredients you’ll need for this adorable Bunny Trail Mix with Printable. Our craft this week is very simple but it creates a fun hoping bunny that actually jumps. Check out the full instructions and tutorial for making your jumping bunny with your preschoolers here. Each week we feature 1 book for the theme as our recommended read along with your preschoolers. However, we know that sometimes these books can be difficult to find or as parents and carers of preschoolers you want to add a few more themed books to the book basket this week. So, in addition, we also recommend 3 other books that are great to read together. 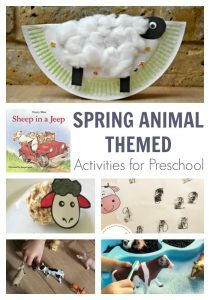 We know that some of our members love to add in more activities so to help you find the best we have handpicked them as find them and added them to our Bunny Themed Pinterest Board which is ideal for finding ideas for Spring and Easter fun with your preschoolers. Our theme for next week is Chicks and we are featuring Count with Maisy. Cheep, Cheep, Cheep! by Lucy Cousins.